It is a potent probiotic supplement as well, if made correctly. 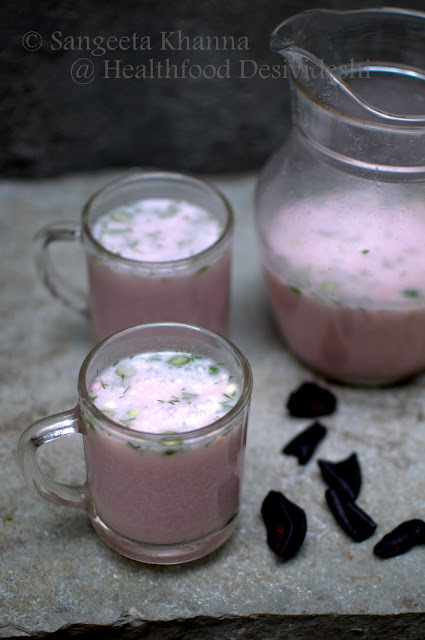 Sol kadi is the drink that is made using a dried fruit called Kokum or Aamsol or Aamsul. It is the dried fleshy skin of a fruit called Garcinia indica, deep purple pink in color, obviously full of antioxidants that the pigment anthocyanins provide. I have worked on this pigment incidentally and that precisely was the reason I used to buy a packet of Kokum whenever I spotted it. Mostly at India International Trade Fair or from Dilli haat. 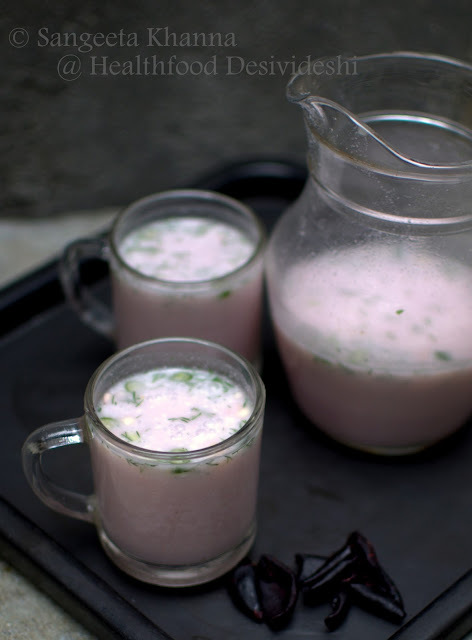 I had tried making Sol kadi at home but it was just a way to get a cooling drink with added salt and seasonings, knowing the cooling and healing properties. I used to make it more like the Aam panna we make in summers. There was nothing special in this drink back then and I used to do a few experiments now and then and like it every time. The attractive color of this dried fruit makes sure you would always like it. But honestly speaking, I had never known how tasty this drink can be, Sol kadi that is. All my previous Kokum drinks turn pale in comparison to the wonderful Sol kadi we had in Goa this January. A cyclist team mate told me that Sol kadi is made in Goa without coconut milk and in konkan Maharashra with fresh coconut milk. He also told me that Goan deep pink Sol kadi is always served with Bangda fish fry while the coconut milk version is more of a Bramhin specialty, who eat only vegetarian food. That was a revelation and made me buy a few packets of Kokum from Goa. I even bought a bottle of Kokum agal , a salt preserved juice of the fresh fruit. Garcinia indica, or Kokum, owing to the presence of high concentration of anthocyanins, is a great antioxidant that works like anti carcinogenic and anti ageing agent. It has cooling, cleansing and digestive properties as well and hence it is served as a watery drink along with seafood in Goa. The addition of green chilies garlic and raw onions makes this drink a perfect probiotic drink as well, especially if you let the ingredients soak for a couple of hours or more in Indian summers. I know it will be a revelation to many who have grown up drinking Sol kadi. We have never valued our traditional foods enough. This is how Goans have it. A hint of garlic, a gentle kick of green chilies and freshness of coriander leaves. The Kokum extract is slightly tart so the drink becomes really refreshing. It can be served as a summer drink or along with meals to aid digestion. Soak the Kokum in water for an hour or so. It releases color slowly and the whole water will be red as soon as you stir it after a while. You can keep the soaking Kokum in fridge so you get chilled Sol kadi when you have it. 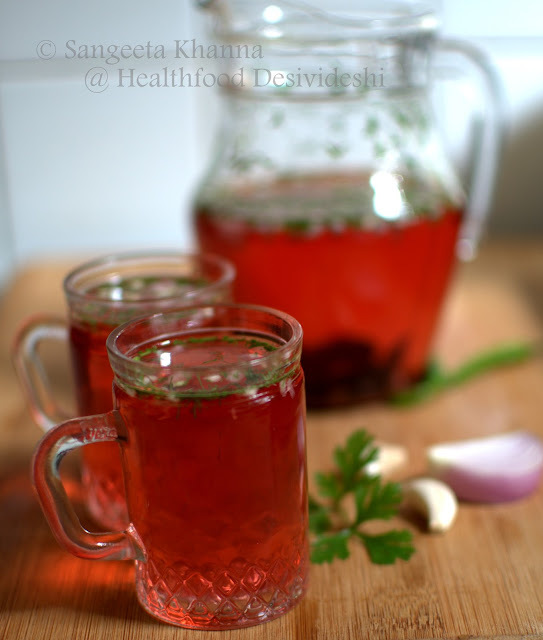 I suggest to add the chopped garlic, green chilies and onions as well along with the Kokum as that would enhance the probiotic content of the drink. The taste also enhances. Add the salts once the flavors have seeped in, takes about an hour minimum. The drink keeps well for a day at room temperature and for a couple of days if refrigerated. After that you might not like the garlicky flavor of the drink but it's probiotic content will enhance. I have had this for up to a week, sometimes refilling the same pitcher with fresh water. And if you are making the coconut milk version, Soak the Kokum in coconut milk and dilute to preferred thickness of the coconut milk. This becomes an entirely different drink, just with an addition of one single ingredient. Some people add a tempering of mustard seeds and curry patta to this drink, you can try if you like. Pretty colors in the drink. You would want to strain the chopped garlic and chilly etc if you like a smooth drink, or chewing garlic in a drink is not your idea of fun. I gulp it all down. You can also try the same. Sol kadi has become a favorite drink now that I know the authentic recipe. More coconut milk in cartons is bought for this. I say good fats and good probiotics and packed with antioxidants, the drink is absolutely healing. Looks very tempting, new to me, would like to try this out. wow, looks superb, I have the one with buttermilk (if I am not wrong) once in Mumbai. I would love this healthy dish for my event @ my blog. Please do send it.